Kai Kuniyuki Sensei was born in Nobeoka, Kyushu Island in July 1943. 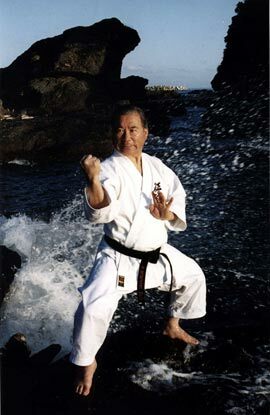 He started learning Karate at the age of 13 under Mori Kyu Sensei, and through him he was introduced to Miyazato Eiichi Sensei, Miyagi Chojun Sensei's successor. After he started learning Yoshinkan Aikido from Shioda Gozo Sensei, Shindo-Muso-Ryu Jodo from Shiokawa Hosho Terushige Sensei, Muso-Jikiden-Eishin-Ryu Iaido from Ikeda Seiko Sensei, Traditional Jujutsu from Kaminaga Shigemi Sensei. He also went to Taiwan to study Chinese Martial Arts (Tai Chi, Taikiken, Hakke-Sho) under Master Isho Kho.